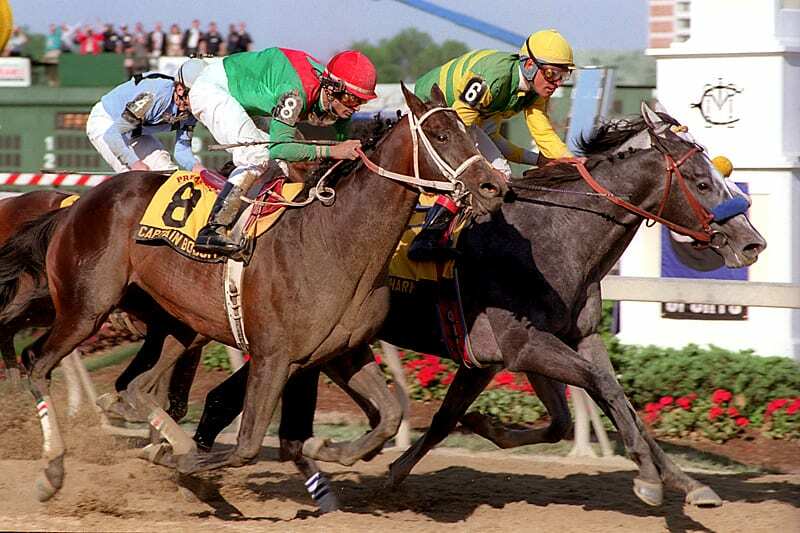 Captain Bodgit narrowly missed in the 1997 Preakness. Photo by Jim McCue, Maryland Jockey Club. This coming Saturday may mark the 142nd edition of the Preakness Stakes, the middle jewel of thoroughbred racing’s Triple Crown for three-year-olds, but it also marks the 20-year anniversary of perhaps the greatest renewal of that event when Kentucky Derby winner Silver Charm edged Free House and favored Captain Bodgit in a stirring three-horse finish that still leaves connections and onlookers flabbergasted. Though Captain Bodgit was a local horse, training at Bowie with Gary Capuano, he had much more than an outsider’s chance. After finishing third in his career debut at age two, Captain Bodgit concluded his juvenile campaign by winning his last five starts, three of them stakes including the Grade 3, nine-furlong Laurel Futurity over Concerto in a race that had connections of both juveniles thinking about the spring classics. Capuano promptly sent Captain Bodgit south from the Bowie Training Center for the winter and the sophomore son of Saint Ballado finished third in both the Holy Bull Stakes and the Fountain Of Youth Stakes at Gulfstream Park in the first two starts of his three-year-old campaign. Following his third-place finish in the Fountain of Youth, Captain Bodgit was purchased privately by Team Valor from owner Phyllis Susini, although that syndicate opted to retain the conditioner at that point and left Captain Bodgit with Capuano to steer through the major three-year-old stakes ahead. Captain Bodgit justified Team Valor’s faith in Capuano when he rallied from well off the pace to overhaul Fountain of Youth winner Pulpit to capture the Grade 1 Florida Derby. In recent years the Florida Derby has been the final prep for the Kentucky Derby for many talented three-year-olds, including 2017 Derby winner Always Dreaming who will be favored in the Preakness, but 20 years ago it was still far enough out from the run for the roses that Capuano shipped the colt back north to Bowie to prepare for the Grade I, $750,000 Wood Memorial where the Saint Ballado colt overcame a speed-favoring sloppy track to win the nine-furlong prep in sharp fashion. By post time for the run for the roses, Captain Bodgit was the 3.10-1 favorite in a race that included Pulpit and California shippers Free House and Silver Charm, the one-two finishers in the Grade I Santa Anita Derby. In Louisville, Silver Charm overhauled Free House in midstretch then just withstood the furious late rally from Captain Bodgit to prevail by a head. Despite the gritty, narrow defeat as the public choice in the Derby, Captain Bodgit would again assume the role of post time favorite in his rematch against Silver Charm and Free House, although Silver Charm’s personable trainer, Bob Baffert, had insisted backers could “bet the farm on the Charm” in the middle jewel of racing’s Triple Crown. Baffert proved to be prescient in his confidence when Silver Charm prevailed between horses to edge Free House and Captain Bodgit to move within one victory of racing immortality. While Silver Charm would taste a narrow defeat at the hands of Touch Gold in the Belmont Stakes, being overhauled in the late stages by a colt who had stumbled at the break of the Preakness and nearly unseated jockey Chris McCarron and then rallied to finish fourth, and that Baffert trainee would eventually go on to much greater acclaim with victories in the Dubai World Cup and Stephen Foster during a stellar career in which he won 12 of 24 starts and earned nearly $7 million, Captain Bodgit would never race again following his third-place finish in the Preakness. 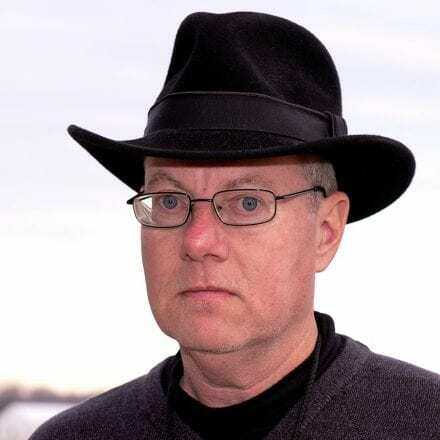 Twenty years later the race still resonates highly with longtime Maryland Jockey Club announcer Dave Rodman, who will call his 27th Preakness this Saturday. After being retired from racing, Captain Bodgit stood stud at Margaux Farm in Kentucky for an initial $10,000 stud fee but later was transferred to Questroyal Farm in New York where he stood for $5,000. Several years later the Kentucky Derby runner-up was sold again and sent to Canada to stand at Highfield Farm for a modest $2,000 fee.